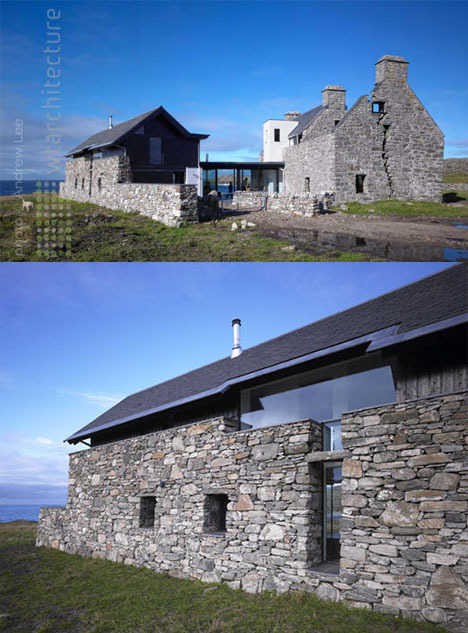 On the tiny island of Coll with just two hundred residents off the coast of Scotland sits a modest masterwork of modern renovation – a brand new home slotted delicately inside the (reinforced) crumbling stone ruins of an ancient local manor. 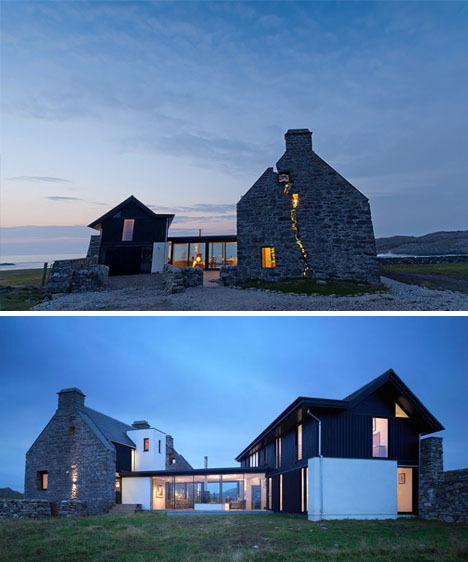 Planned around its predecessor, the new construction helps shelter the old, takes advantage of existing wall heights, window perforations and more to create a beautiful balance. 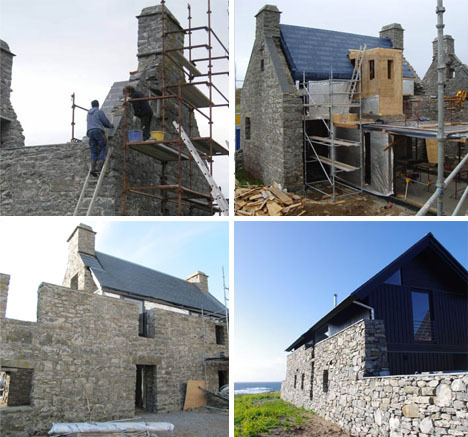 Stainless steel frames were delicately introduced to help hold existing walls together, prop up the sagging chimney and support a new door-overhanging lintel made of local stone. While digging to pour a new foundation, bronze age pottery was found and carefully exhumed. 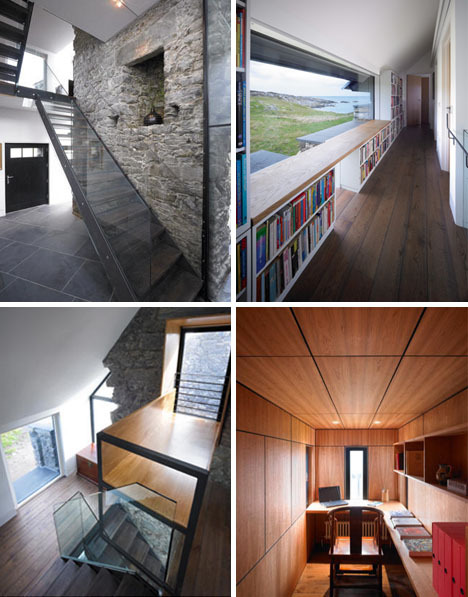 The open-plan interior has layers of fresh-finished wood, flat reflective glass and sleek black-coated steel right alongside aged stonework walls, setting them apart visually while tying everything together … and placing the rough vintage edges, cracks and crevices in easy-to-touch locations throughout. For all the polish of the finished product, construction was anything but easy. 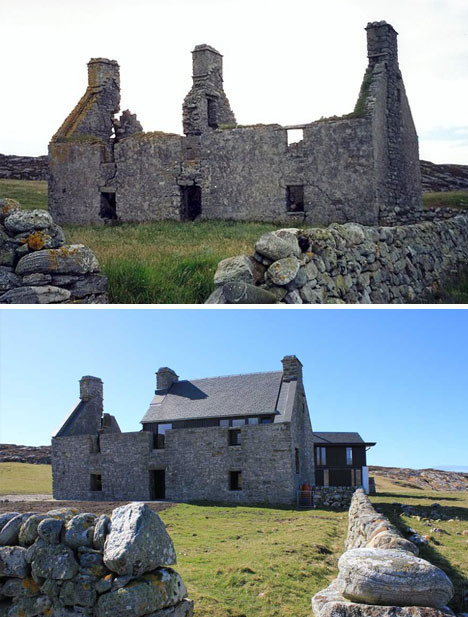 Between the fragile frame of the building and the fierce ocean winds, simply stabilizing the existing building remnants took WT Architecture months of careful planning and execution. 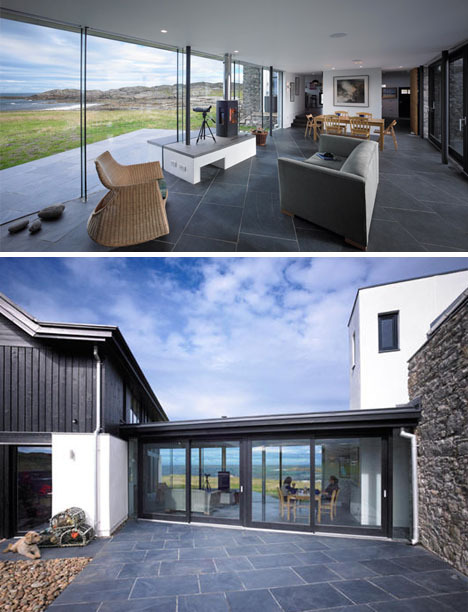 Outside the new structure, a high performance aluminised builder paper maximizes the insulation value of the building fabric while much sealing was required to bridge gaps between glass windows and stone frames. Overall, the intersections of modern forms and existing elements is beautifully balanced both from a large-scale and down-to-details perspective.